A few months into the season and we're already seeing how tempestuous the loan market can be. A real topsy turvy affair - though some have flourished, others have found that the supposed guarantees of first team football away from the Etihad aren't always quite what they appear, often nothing more than a fickle, tempting mistress. It's a cruel market, yet a necessary one as City look to give their youngsters the experience they need. This is the first of a regular feature, with the second coming tomorrow, that will hopefully take a closer look at the success, or lack of, of those out on loan. A fair few of City's youngsters have looked to spread their fledgling wings. George Evans, James Horsfield, Jack Byrne, Brandon Barker, Jason Denayer, Seko Fofana and Oliver Ntcham, to name a handful. It's been mixed, to put it simply. It'd be short-sighted to use the lack of success during a loan spell as a true reflection of a player's ability however. It's a complicated matter - the players are young, often away from friends and family and they're immediately thrust into an alien environment amongst players they often know little about, in a team that won't work how they're used to. There's a whole host of extraneous variables that are outside of the club's control. That's not to say the player will always be blameless, but it's worth considering. Harry Kane made no lasting impression during any of his loans, yet look at him now. It happens. Potentially great players can be lost to a poor move, and its impossible to accurately predict. In an ideal world the club would keep the players in-house where they could hone them in a competitive environment that they can control, but unless B-teams are ever introduced that simply isn't possible. There will be successes, and there seemingly has been, but for every hit, there will likely be a miss. For now though, this will have to do. Starting on a positive note, George Evans’ move has been an undoubted success. Evans joined the Midlands club initially on a short term deal before the move was extended to the middle of January. He’s been a breath of fresh air, impressing with some imposing performances as Walsall stormed to the top of League One. It’s highly encouraging – exactly what he needed. There has never been any doubts about Evans’ ability on the ball. He’s a composed, technically proficient midfielder. Very neat and measured. Yet there’s always been a question mark hanging over his head whether he had that little something extra, an x-factor if you like, to make him really standout and warrant an inclusion in the first team’s plans. Buoyed by making his debut for City in the Carling Cup he’s taken that confidence with him to the Bescott Stadium. He’s seemingly adding goals and assists to his game, wracking up four strikes, and match-winning ones too. He’s thriving, revelling in the competitive environment around him, and he’s growing physically. He’s tall, strong, has a good turn of pace and he can pass, tackle and now, seemingly, he can finish. There’s only a year and a half between him and Dele Alli, though there’s a world of experience between them professionally. In contrast to Evans, Alli was a regular from a young age for Milton Keynes, excelling as a goalscoring threat for a League One side. Evans is doing the same now, and he’s still young. It remains to be seen whether Evans will get that chance at City, but he certainly couldn’t be doing anymore as it stands. A mixed spell. Zuculini moved to Middlesbrough back at the start of November, and like Evans, he was immediately thrust into the limelight. He did well. Boro fans were impressed, citing his drive and box-to-box game as real positives. Since then things have gone downhill a tad. He’s become something of a squad player with only three starts alongside two substitute appearances. He’s not looked out of place, but he’s since been shunted aside for those returning from injury who there before he arrived. Understandable, really, though not what City would have hoped. It’s almost certainly another nail in the coffin of what was always a curious signing. He looked encouraging during his preseason games, yet a disastrous loan spell at Valencia, followed by another at Cordoba, has lowered expectations and all signs seem to point towards a summer exit. That might not happen. He could stay and a miracle could happen, and it’d be a welcome one too as he seems a likeable player, but the loans move so far haven’t suggested otherwise. The Irish attacking midfielder had a slow start to life in Holland. Injuries limited his initial involvement as he frustratedly watched on from the sidelines. Thankfully, since returning he’s been a regular, impressing with some encouraging displays. He clearly isn’t out of place technically, that much was evident from the off. Byrne’s a very tidy footballer. He’s an excellent passer and he gets forward well, and he gained the notable honour of becoming Cambuur’s youngest ever Eredivise goalscorer when he scored his first ever professional goal in a 4-1 win over Excelsior. It was good too; a lovely little one-two saw him burst into the box before finishing coolly to the keeper’s left. He made headlines with his passing too, completing 55 out of the 56 passes he attempted. Impressive stuff, and the winter break arguably came too soon for him and Cambuur as the team picked up form. They ended 2015 with two strong wins, a 3-1 win against NEC and a 4-1 win at Excelsior. Byrne played an integral part in both. This move could do him a world of good. There are no doubts regarding his ability, and if he can find a way to assert himself when the team isn’t as on top as much as they’d like to be, then he’ll have everything on paper. He needed this professional experience to see if he can hack it amongst men, as opposed to the u21s he’s used to. He can. A strong finish to the campaign, and its possible seeing as he’s clearly settling in at this level, will mark him out as an interesting proposition come the summer time. The twenty year old local lad made his first steps into professional football with Doncaster Rovers after joining the League One side at the back end of September. A strong, committed defender, also capable of playing in a host of positions across midfield, Horsfield made three appearances, mostly at right-back, before he returned to City. It was a low-key move, with an initial solid debut display giving way to some slightly nervy performances, based off the impressions of some of Doncaster’s supporters anyway. Understandable considering it was his first steps into professional football. The experience would have surely been vital for the young defender though, and he was a surprise inclusion on the bench for the first team against Leicester City. Another temporary move away from the CFA in January could be a possibility. 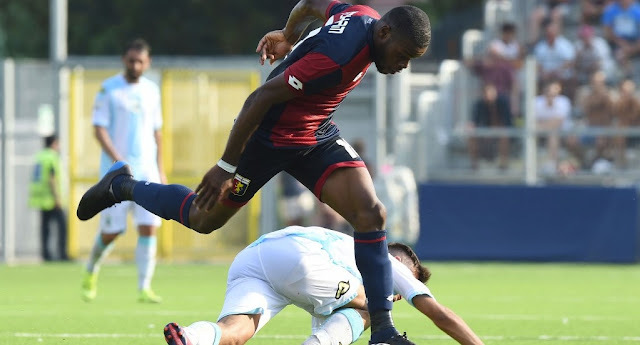 Ntcham started like a house on fire for Genoa. All power and bluster, he earned rave reviews in his first few games as he took to life in Serie A with relish. He was surprisingly labelled as the new Pogba - clearly an overreaction, but he did turn heads and the comparisons are understandable, if a little lazy. Both are tall, athletic French midfielders with an eye for the spectacular. That's where the similarities end, for now at least. Ntcham is raw. Very. Naturally, things have tailed off a little. This is to be expected. He's young. It's easy to forget given his foreboding physique, but Ntcham is still only 19. He turns twenty in February, and by that point it's likely that he will have made fifteen, if not more, appearances for a good Italian team in a tough league. That's heartening, and it'll surely bode him well as he looks to firmly establish himself next year at Genoa as a regular in the second half of his two year loan. The fire may have dampened a little at the moment, but that is hardly surprising for any player making his first steps into the professional game. Patience is needed, and he'll get it too. A curious one. There's seemingly a never-ending line of talented young African players who seem to flit on and out of the Etihad. Yeboah's the latest. Whether he'll disappear like a lot of them seemingly do isn't certain yet, but there's promise here. The club picked up the young forward after he was named the 'Most Valuable Player' at the African u20s championships for Ghana. He trained with City's first team before moving to Lille on loan at the start of the campaign. Initially with Lille's second team, he was recently afforded a shot at the big time after spending several games as an unused sub. He's made a handful of appearances so far in Ligue 1 and reports suggest he's a bright player with some calls from fans for further involvement. Skilful and direct, and strong, if a little small, he's impressed in his cameos playing off the striker. Still only eighteen, miles away from home and in a country with a language he doesn't speak, it's been a very solid start to life in France all considering. Part 2, featuring Jason Denayer, Seko Fofana, Brandon Barker, Angelino, Enes Unal, Ian Lawlor and Shay Facey will be posted tomorrow.